In the past 5 years, the ability to harness the power of the immune system in the treatment of cancer has brought about a paradigm shift whereby some of the most feared diseases, such as melanoma and lung cancer and even late-stage metastatic disease, can be eradicated. 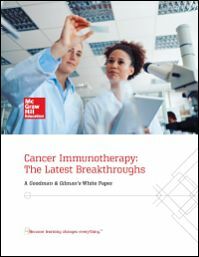 This free white paper offers an overview of the latest breakthroughs in cancer immunotherapy. Please fill out the form to download this free white paper.